Summoned by the dying General Sternwood, Philip Marlowe is asked to deal with several problems that are troubling his family. Marlowe finds that each problem centers about the disappearance of Sternwood's favoured employee who has left with a mobster's wife. Each of the problems becomes a cover for something else as Marlowe probes. 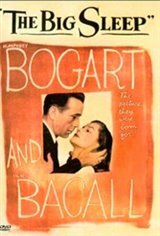 This is one of the six films starring real-life lovers Humphrey Bogart and Lauren Bacall.